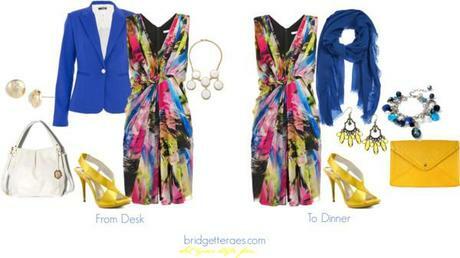 There isn’t one woman out there who isn’t looking for easy ways to transition her work outfit to an evening outfit. In the fast paced, multi-faceted world we live in we need to move and we need to move fast. Often, these transitions throughout the day require different looks. The biggest cry for help I get from many of my clients is how to go from work to a night out without changing the entire outfit. Makes sense, but how can it be done…easily? The look above, that goes from daytime to evening, is great in work situations where you want to take a dress and transition it into a more formal event after work. Yes, it does require bringing an additional purse, jacket and accessories to the office, however, in situations where you know that you have to be dressed well, and don’t have a lot of time, taking the few extra pieces to the office isn’t a bad idea. These looks also show the versatility of one dress and how easy it is to dress up or dress down with a few accessory changes; a great idea if you are traveling for business and need to pack light. In the case of needing to take a suited look from work to an event, it is smart to choose a layering piece and handbag that can take you from daytime to nighttime. Doing so, you only need to bring a change of shoes and more evening appropriate accessories. This is a great transitional look in cases where you may have a work event and just want to formalize and freshen up your outfit before attending. 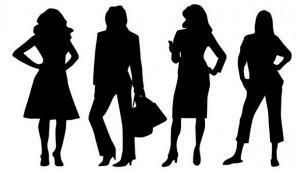 Changing your look for an event after work does not mean that you have to get all glitzed up. You may want to meet some friends for dinner or go to happy hour. In this case, you may not want to change your entire outfit but would like to look a little less corporate when you leave the office. For this “desk to dinner” look, I chose a metallic bag because it is the type of bag that works for both day and night. Next, for the after-work look, I chose accessories that were a little less conservative. Lastly, you can choose to bring the jacket with you or leave it at the office if you want to bare a little skin when you go out. 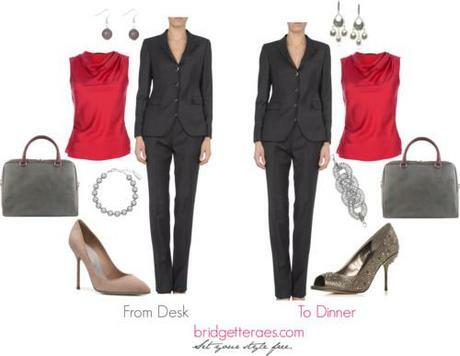 Here is a way that you can take an appropriate office look and make it a little sexier after you leave for the day. Paired with a pair of black pants, I chose a wrap top that has a deeper neckline and placed a tank underneath it for the office. For an evening out that tank could easily be removed for more exposure. Lastly, instead of a structured suit jacket to cover bare arms, I chose a cardigan that is office appropriate but could still be brought along after work without looking stodgy. I traded out the more conservative jewelry for a blingier pair of chandelier earrings, necklace and a racier pair of shoes. Lastly, I untucked the top to make the whole outfit more relaxed in appearance. If you’re looking for a more feminine after-work look, perhaps for a date or a night out with girlfriends, I chose a printed summer dress. Paired with a more tailored jacket and toned-down jewelry, the dress for day is less frilly looking. Yet, for an evening out, when paired with a soft wrap and more feminine accessories the outfit is softer and more girly.